Note to Justin Bieber. This is what a proper night out looks like. 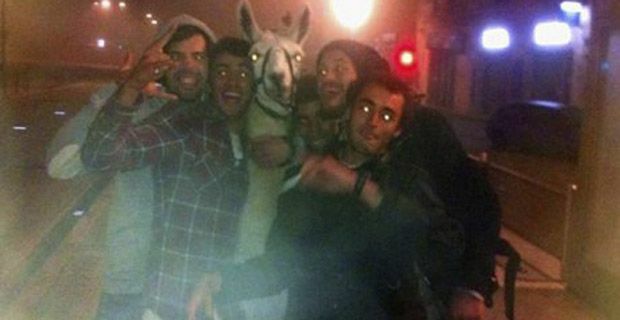 Five likely French lads tucked into copious quantities of alcohol at a local nightclub, and on deciding the night was still young, nipped into a circus, liberated a llama and went on a woolly jaunt through Bordeaux. They finally came a cropper when the llama, who was naturally named Serge was caught travelling on a local tram without a ticket and the adventure started to unravel. The ‘Bordeaux Five’ had initially piled into the circus looking for a zebra to hang out with, but when the resident zebra seemed impervious to their charms, they moved their attentions to the more happy go lucky outlook of Serge. With Serge more than happy to head out on the razz, they set off into a wine drenched night, where there seemed to be only one thing for it – public transport. The initial response to the escapade was stern, with the director of the Cirque Franco-Italian, John Beautour threatening legal action. But as pictures of Serge living the urban dream started to go viral, not only did Beautour withdraw his police complaint, but the whole of France seemed to undergo a cathartic chuckle in a sea of malaise. A Facebook group, ‘Support the Bordeaux Five’ has attracted over 750,000 followers and llama related comedy has spread through the internet like wildfire. It’s just one of those stories that restores your faith in human nature as we drown in a sea of manufactured cool.